I am a volunteer mentor with On The Level: a Rethink project providing mentoring to young people leaving care, to ease their transition from being “looked after” to living independently. The nature of the role means it’s something that I rarely blog or tweet about. However, we have monthly training sessions that sometimes cover interesting topics that can be shared, such as how youth mental health services work and drugs awareness training. 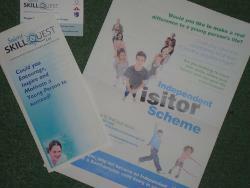 Tonight, one of the things that came up was an overview of some of the other youth mentoring projects in the area. I’d heard good things about them before, and it was interesting to hear more about them. I thought it was worth sharing an overview of two projects in particular that sounds like they are worth looking at. If you live in the Southampton / Winchester area, maybe one of these would be a fun way for you to help make a difference in a young person’s life? I went to Bath for openMIC this week (part conference, part barcamp – a brilliant and informative day on innovation in mobile). The first half was made up of traditional conference-style presentations, and during one of these presentations, I noticed tweets with the #openMIC hashtag become particularly active: feedback that the presenter was missing. This isn’t a new idea: I’ve heard of large US tech conferences where the backchannel is displayed on a second screen or projector next to the presenter’s slides. But I rarely get the chance to present where there is the facility for projecting to two screens at once. So I got thinking about how a compromise could work: embedding a live twitter search somewhere within a presentation. I had a bit of free time this afternoon to play with the idea a little more. As is sadly often my way, my first few ideas were needlessly overcomplicated: using macros, VBScript or something like that to try and get data from the web and embed it within my slides. Fiddly. And prone to a number of fundamental issues, such as trying to avoid reloading the twitter search every time you change slide. 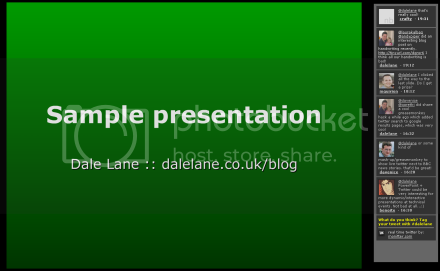 Instead of fighting to embed a website within a presentation, what about embedding a presentation within a webpage? A little bit of playing around with code, and I managed to pull a quick proof-of-concept together. I wrote on Sunday about my first attempt to use Gimp to script some image manipulation stuff I wanted to do – specifically, combining multiple images into a single, multi-layered image. A few people have asked me for more info about how to do this, so I thought I’d share my script here. Gimp is an open-source image editor, but it also comes with a batch mode where you can run it’s functions from a script. The scripting language for Gimp is called ScriptFu, and is a Lisp-type language. I’ve not done anything in Lisp since learning Scheme at University… so it felt a little odd at first. This was my first attempt at writing in ScriptFu, so it’s worth pointing that I’m not an expert, and what I’ve written might not be elegant or the “right” way to do it. But I did manage to get something working in a few hours of playing with it. The doc – The documentation on scripting at docs.gimp.org is fantastic, and got me off to a quick start. It includes enough snippets and samples that I could see the sort of thing I’d need to do. Gimp’s PDB – If you launch Gimp, go to Help -> Procedure Browser. 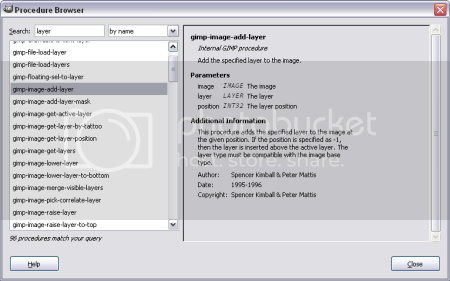 It starts up a very neat searchable API doc for all of the Gimp functions. Even when I didn’t know the name of functions I needed, typing a quick guess (e.g. “layer”) into here would show me a few sensibly-named options, and show me the full API info for them all.